How helpful are certain plants in cleaning toxins from soil? Will 3D printing technology eventually create anatomical replacements? Can a fitness curriculum help firefighters prevent injuries? What is exciting about these topics — and about 17 more like them — isn’t that students and faculty at Grand Canyon University are posing such questions. It’s how they will attempt to arrive at the answers that is of major significance. In the dawning of a new era, GCU’s College of Science, Engineering and Technology (CSET) this fall established a scientific research program on campus. “One of the things I was brought here to do was to revisit the idea of whether we could build a research capability for the faculty and students,” said CSET Assistant Dean Jon Valla, who came to GCU in June 2015 after working at Midwestern University in Glendale, Ariz., and Barrow Neurological Institute in Phoenix. The resounding answer, Valla learned, was yes. Once it was proposed, science faculty and students began flocking to the fledgling program. The reasons are clear. Promoting a research capability in the sciences gives GCU students an edge in applying for medical and graduate programs. They can also dig deeply into subjects they care about and strive for outcomes that make a difference in the world. “This also improves the scientific reputation as well as the overall reputation of the University,”Valla said. Valla said dozens of students have applied for the extracurricular projects. “The students are so hungry,” he said. The research is in addition to work performed at GCU’s Center for Innovation in Research and Teaching (CIRT), which publishes the Journal of Instructional Research (JIR) online. The research opportunities, however, do not detract from GCU’s superior reputation as a “teaching university” in which faculty responsibilities are first and foremost to instruct students. “We will continue to be a teaching university first, but now we will be a teaching university with a research capability,” Valla said. Environmental sustainability: Dr. Randhir Prakash Deo, a CSET professor, has conducted extensive research on the impact of contaminants in the environment, and several projects he plans to explore will utilize his expertise. A project he is leading will research the effects of certain pharmaceuticals after they pass through humans into the environment. “Wastewater is not able to degrade these stubborn chemicals,” Deo said. In addition to monitoring, calculating a risk assessment and creating a remediation plan, Deo intends for students to take the scientific process a step further and propose action strategies for change. Phytoremediation: Deo is teaming with CSET professor Dr. Neal Adam on a phytoremediation project to research the use of plants to cut down on pollution and assess environmental health. 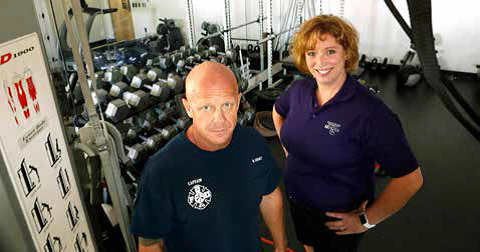 Firefighter wellness: Goodyear (Ariz.) Fire Captain Branden Husky and Donna Gerakos, a CSET assistant professor, have been hard at work investigating a curriculum to improve the health and decrease the injury rates of firefighters. A 21-year firefighting veteran, Husky has witnessed first-hand the kinds of problems that put firefighters out of commission. Back injuries are number one, Husky said, followed by knee and shoulder injuries, heart disease and crashes to and from scenes. “The top four we can do something about,” said Husky, who is enrolled in GCU’s exercise science degree with a sports performance emphasis. “Until now, I never thought of firefighters as athletes,” Gerakos said. Gerakos met with Husky to develop the strengthening and conditioning program. They met their first goal: Teaching a class at the Arizona State Fire School. The first research projects are focused on biology and chemistry, Valla said, but engineering, IT and computer science soon will follow. “The hope is that other colleges will follow the same model,” Valla said.